Crashing waves outside the tent walls make it hard to keep my eyes open. It's a dark April night and the tent is parked on smooth sand. After spending the better part of four months in the mountains, this west coast beach is welcome and extremely comfortable. When the waves crash I imagine the millions of little grains shifting around before settling again, grinding shells and larger stones in the process. The sound is rhythmic but occasionally one wave hits the beach softer... or much louder. The boom of the occasional loud wave sends chills down my lower back. Tomorrow I'll wake to the exact same sounds but from a greater distance, with the waves crashing further off shore. I'll also wake to the sound of swooshing wings as a raven passes not far above the tent. Before I drift off to sleep, my thoughts will shift to pondering the rhythms and cycle of water in nature. After all, the oceans of the pacific are the source of moisture of our clouds that bring us winter snows in the mountains. Years of accumulating water locked in a frozen form builds into masses we know as glacier. The landlocked ice moves like a slow plastic river. With bends and turns the frozen beast shivers and quakes, letting out loud groans and sounds like a deep crack of the whip. This disappearing mountain ice is grinding and churning mountainsides and valleys. A larger more powerful bulldozer there never existed. As boulders trapped in the mass of flowing ice continue downhill, they score and grind the surrounding earth and rock. 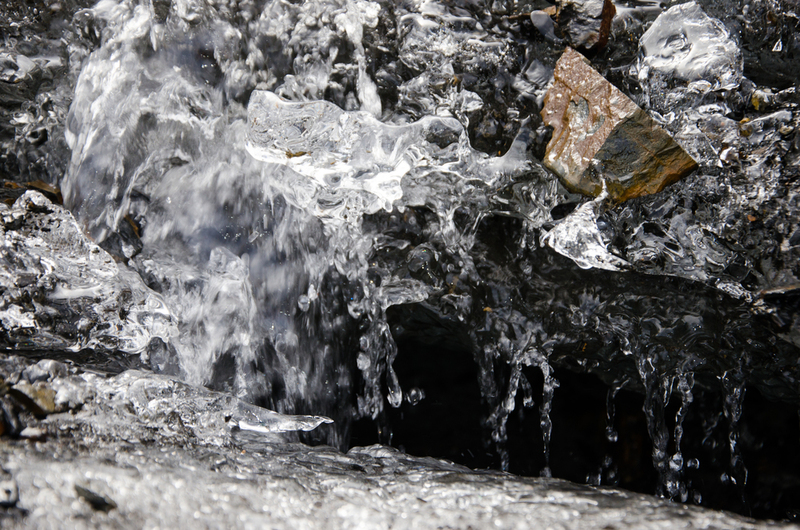 Eventually the water will receive enough energy to be released from its frozen form before flowing downhill and plunging into dark caverns on the glaciers surface. These deep bowels, these moulins, do not lead to Alice's Wonderland. The water worms and squeezes between rock and a cold place before finally emerging from the toe of the glacier into a stream. Released from their captivity of ice, droplets by the billions take advantage of a new-found freedom to rush downhill off the mountain. They bump, bubble, churn and whirl and in their momentum whip underlying sands into their foam. From a water droplet's perspective it's like a massive game of pinball and go-karts; the arena sets the stage. Waterfalls, sharp embankments, tight gaps, underground channels, cascades provide a brown-pant rated rollercoaster. The furious waters sculpt the landscape long after the glaciers have left them. Eventually the water slows when it nears valley bottom but by then it is moving en mass. The movement of the droplets resembles more like a ballroom dance instead of the dubstep dance club upstream. At this point, all sorts of silts and minerals are swirling within the waters. Bears, wolves, moose, deer and eagles patrol the edges. Trout and salmon find home in the currents. Cottonwoods and cedars spread their roots into the riverbanks sourcing the waters and minerals. This far along the journey, the flow of water is constantly adding to itself from side channels, if it ever again gained speed it would be a force to be reckoned with. The river now is often volatile, bi-polar and unresolved as to it's path. Over the course of centuries, to the annoyance of the trees, it continues to change its course. Channels fill and floods carve new channels for the river. It topples trees and stacks them like toothpicks, remembering it's bulldozer nature. The waters worm their way for great lengths before eventually reaching the opening waters of the estuaries. A delta full of creatures accepts the river into the salted ocean waters. Call it a long reunion after hundreds of year. One that might have spanned thousands of kilometres. A quest that ground mountains, toppled trees, brought life and carved valleys. 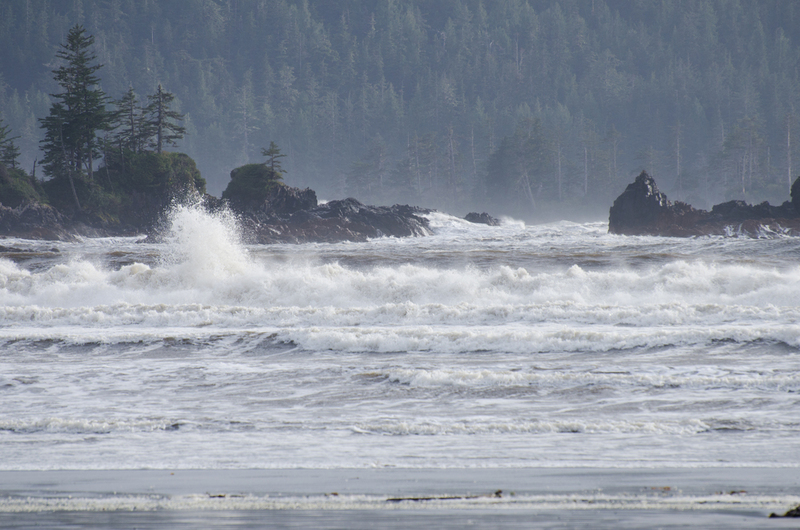 All to rejoin the thunderous boom of the pacific ocean's waves.